History Review as “Size Matters” in 2011. 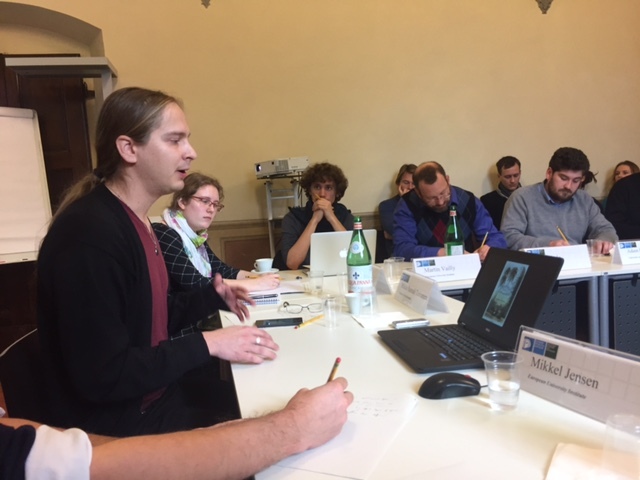 In December 2016, it was time again to meet – this time at the EUI discussing “Working with Space“. In between a number of PhD researchers have used the ERASMUS postgraduate link between both institutions for individual visits of up to a semester. 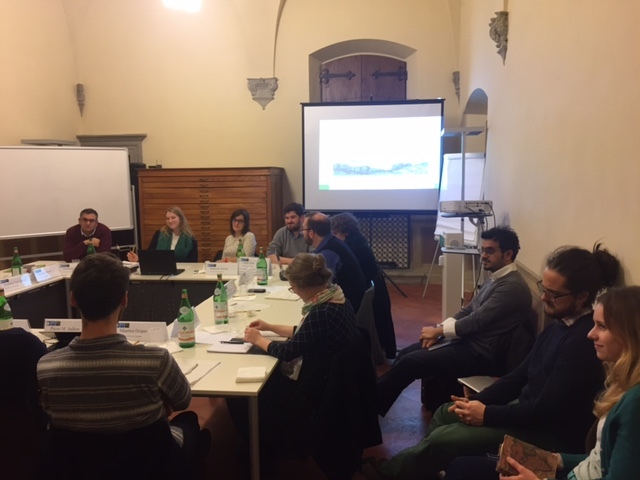 The “Working with Space” workshop was led by Pablo Hernández Sau, Martin Vailly and Nazli Songülen (all EUI) and co-convened by Regina Grafe, Stéphane van Damme, Pieter Judson (all EUI) and Bernhard Struck (ITSH). The meeting in the stunning Villa Salviati brought together 12 PhD researches from both institutions and a number of visitors. Set up deliberately as a workshop and discussion forum we explored the many and varied dimension of Spatial History. The workshop discussed both analytical questions around space and spatial history as an object of enquiry, as a (heuristic) tool, and as the historian’s framework. Individual panels and presenters zoomed into specific fields including travel, economy, and knowledge / science. Around these fields a number of different approaches to space were discussed including mental mapping, networks of actors, epistemic communities, or spaces of opportunities. The discussion around the workshop can be followed on Twitter via #workingwithspace. The St Andrews pre-workshop writing can be found here. Thank you very much for your kind and very generous hospitality – see you @ITSH. A number of our individual research projects share an interest in space and spatial history. Defining transnational history as a way of seeing and a perspective that is interested in people, in nodes and honeycombs (P. Clavin) as well as the flows and connections across borders, raises pressing questions: Where is transnational history? Does transnational history need to rethink spatial issues? What kind of maps and visualisation could be integrated in transnational history – both as a way of analysis as well as narrative and story telling? It is interesting to see that, over the past ten to fifteen years, an interest in spatial history (spatial turn) as well as in transnational (and global) history has developed almost simultaneously. If we accept that space (Raum / espace) is not simply absolute, a fact or a reality, but a product of social interaction and thus made, this would feed back into the questions raised above. At the same time, new and previously unprecedented technologies of communication and mapping have become available. By asking: Where is transnational history? How to bring space back in? we seek to address these questions in a loose series of reading group sessions (held at the Centre for Transnational History), small-scale workshops (at St Andrews, in collaboration with GRAINES and beyond) and presentations/panels at a number of conferences. What we seek to explore across projects ranging from travel activities to the Habsburg Empire (Martin Schaller), global cities (Emma Hart), alpine regions (Dawn Hollis, Jordan Girardin), scientific networks around 1800 (Sarah Easterby-Smith), spatial issues related to national socialism (Riccardo Bavaj) or transnational biographies (Bernhard Struck) are ways to tell these stories through technologies of mapping and visualisation. The first meeting for the workshop / reading group on space will meet Wednesday 16 October 2013, 5.30pm. The venue is room 0.02, School of History, St Katharine’s Lodge, The Scores, St Andrews.